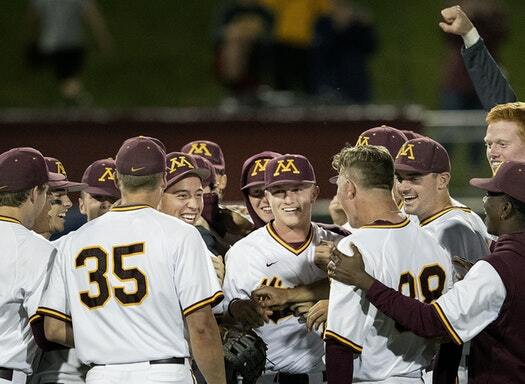 The Golden Gopher baseball team won all three games at the Minneapolis NCAA Regional over the weekend. 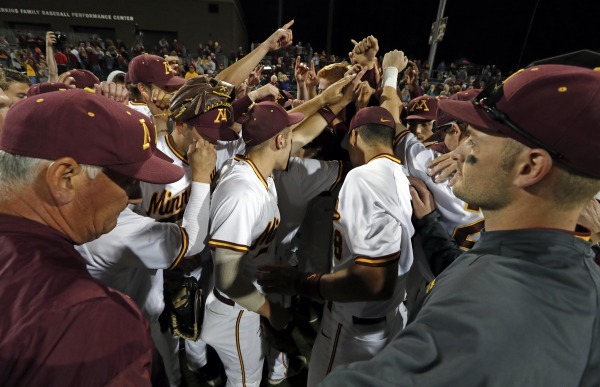 Friday night, Minnesota routed Canisius 10-1. UCLA had won earlier in the day against Gonzaga. 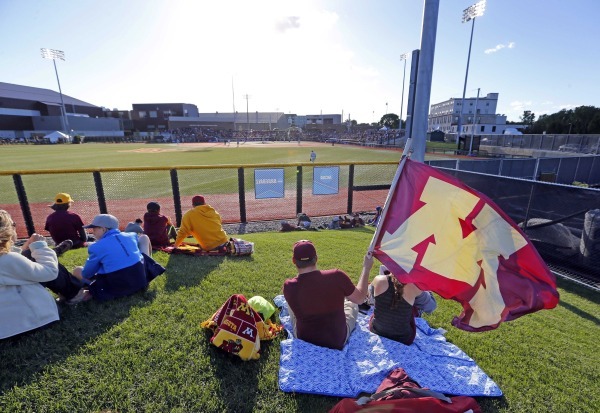 Friday night saw a record crowd at the new Siebert Field. 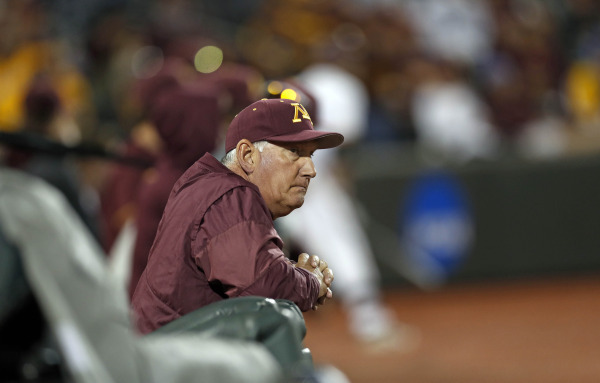 Coach John Anderson led the effort to rebuild and keep the aging ballpark on campus, with current Minnesota Twins manager, former Gopher, and MLB Hall of Famer, Paul Molitor the head of fundraising. No public funds were used in the construction. As a student at Minnesota, I spent many a sunny afternoon at the Old Siebert Field, just hanging out, doing a little homework between innings, and enjoying some great college baseball. On Saturday, Gonzaga knocked Canisius out of the tournament, in a rain delayed game. Minnesota took on UCLA in the nightcap, and lightning early in the contest, delayed that game even further. A pitchers’ duel took place after the lightning, with UCLA taking a one run lead late into the game. Due to a freak coin flip, Minnesota was the visitor in their own ballpark. In the top of the eighth, Gopher All-American shortstop, Terrin Vavra, led off with a double. Eli Wilson then followed with a single, bringing Vavra in for the tying run. The game was tied 2-2 at the end of nine, when Vavra again led off the 10th with a single. He would score the winning run on a double by Micah Coffey. Minnesota gets the after-midnight win 3-2. UCLA would beat Gonzaga for a second time, for the right to face Minnesota in Sunday night’s championship game. This game would not be a pitchers’ duel. In fact, the first 1-2-3 inning did not come until the fourth, for either team. Neither starter made it out of the third inning. Reliever Jackson Rose came in for Minnesota, throwing four relief innings, giving up only one run. 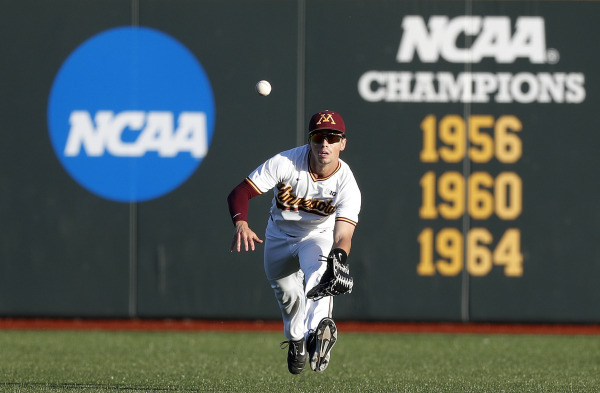 Toby Hanson hit a three run homer for Minnesota, and Alex Boxwell hit a two run homer, and drove in four runs, as Minnesota out clubbed UCLA 13-8 in front of another record crowd. Minnesota now travels to Corvallis, OR to play the Beavers of Oregon State University in a best of three Super Regional. The winner of that series travels to Omaha for the College World Series. This entry was posted on Tuesday, June 5th, 2018 at 6:42 AM	and tagged with baseball, history, Minnesota, NCAA regional, photo and posted in sports. You can follow any responses to this entry through the RSS 2.0 feed.